“Fool me once, shame on you. Fool me twice, shame on me.” Our previously disappointing experience at Qahwa’s Waterway branch has stuck with us, but with the restaurant launching a new menu, we decided to risk being fooled once more at their branch in Arkan Plaza. 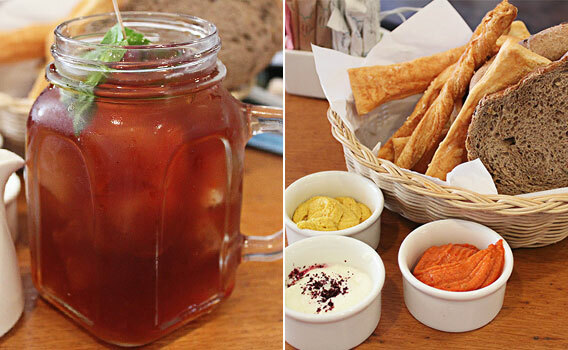 From a refreshing detox and iced tea selection and a gourmet cheeses platter, to new egg sandwiches and a fun kids menu that includes Chicken Lolipops, the variety on the menu is the good kind of overwhelming, but on paper, few restaurant can top Qahwa’s current breakfast menu. While waiting for our food, the waiter came with our Peach Tea Punch (30LE) and a huge complimentary basket of freshly baked bread. Served alongside three dips, it was the flavourful hummus dip that stole the show. Honestly, we could’ve devoured the basket in no time but we had to control ourselves to leave space for the food we ordered. Meanwhile, the peach-infused black tea was very refreshing and the peach flavour was strong, but we didn’t feel the presence of the mint, lemon and orange flavours mentioned in the menu at all. We kicked things off with a Waldorf Salad (52LE) to share. 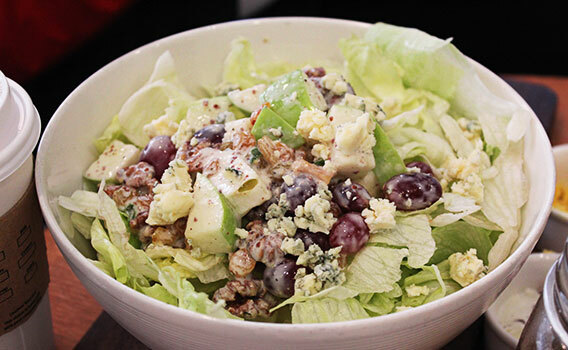 The salad came in form of a giant bowl filled with a bed of lettuce, topped with walnuts for a great crunch and sharp and nutty crumbled blue cheese which worked perfectly with the sweet and tart flavours of the red grapes and the cubes of green apple. It was an incredibly good salad; we loved the diversity of textures and flavours in it and the portion was humongous. From the incredibly good, to the egg-ceptional, we opted for The Truffle Omelet (67LE) and The Mincy Benedict (62LE). 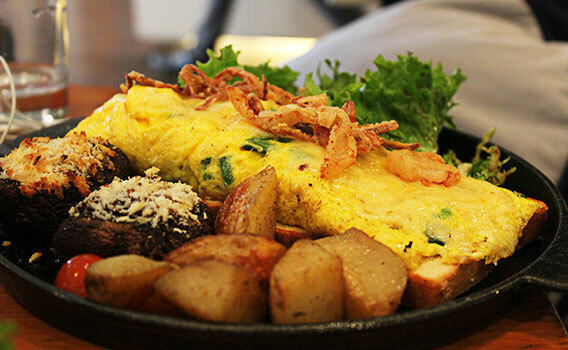 Served with simple potato cubes and a delicious Portobello mushroom stuffed with a rich creamy mixture and topped with truffle cheese, the eggs were mixed with chives, Portobello mushrooms and truffle cheese to create a very light, fluffy, and perfectly cooked omelette bursting with earthy flavours. The fried onions on top added a great crunch and slightly sweet flavour to the dish. 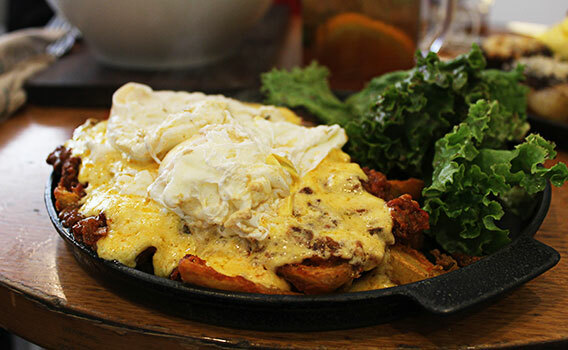 As for the Mincy Benedict, it was simply two poached eggs that had flawless runny yolks, lying on top of potato wedges, minced beef bursting with tomato and spices flavours and a rich cheese sauce that had a spot-on consistency. Despite the unappetising presentation of the sloppy poached eggs, we really enjoyed what is essentially a chilli cheese fries-like version of poached eggs and it makes for a perfect brunch item. Just when we thought the meal couldn’t get any better, the waiter recommended The Melting Chocolate Bomb (45LE) which is not listed on the menu. The dessert consists of two layers of super chocolaty and moist cake and a layer of chocolate and hazelnut spread in-between which had wafer bits in it for an unexpected yet very pleasant crunch. It’s all topped with a chocolate ball that is melted by the waiter with a pouring of hot chocolate, which reveals a hidden scoop of vanilla ice cream inside. It’s a very sweet and very chocolaty dessert but it was worth every single calorie! Even though it was a Friday morning – the busiest day for Qahwa – the service was great and fast, and we loved everything we tried from the new menu, which makes us wonder how it all went so bad last time. 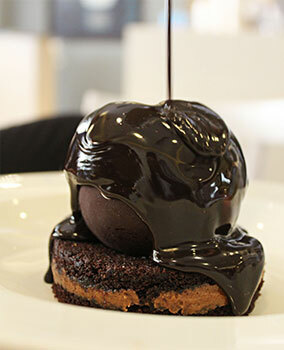 Ask the waiter to save the Melting Chocolate Bomb as soon as you arrive because it runs out in a blink of an eye. The Truffle Omelet and the Melting Chocolate Bomb were out of this world. The indoor area isn't well ventilated.